Collaborate on files with other contributors at the same time. When creating a document, sometimes you need to solicit input from other people. In a typical scenario, you might save your document on your local drive and then email the file to others for input. You cannot see their changes until they send the document back to you. Time is wasted in exchanging emails, consolidating comments, and verifying information. This is where co-editing can help. 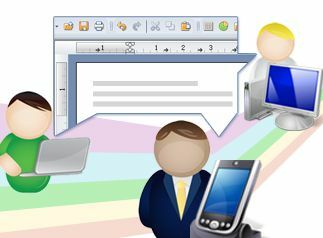 Contributors can edit the document at the same time and view changes immediately. The only requirement is that you share the file and give editor access to contributors. Editor changes are highlighted in different colors so that you can always tell who made the update. You also can see who is editing the document by viewing the editors' photos in the sidebar. Linda is an assistant in the IT department. She is required to submit status reports to her manager each week. Linda creates a document and needs data from IT representatives of the five teams. Before using IBM® Connections Docs, Linda had to send email attachments to each representative, and then merged the responses that were sent back by each person. With Connections Docs, Linda now creates a document with a table, shares it with the five representatives, and asks them to complete their required sections. When the document is completed, Linda shares the document with her manager.